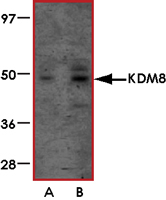 Sample Data :Western blot analysis of KDM8 in human liver tissue lysate with KDM8 antibody at (A) 1 and (B) 2 ug/mL. 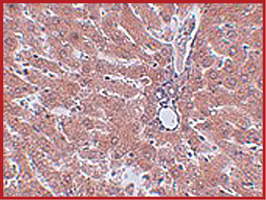 Sample Data :Immunohistochemistry of KDM8 in rat liver tissue with KDM8 antibody at 2.5 ug/mL. 1. Takeuchi T et al: Roles of jumonji and jumonji family genes in chromatin regulation and development. Dev. Dyn.2006; 235:2449-59. Agger K et al: UTX and JMJD3 are histone H3K27 demethylases involved in HOX gene regulation and development. Nature 2007; 449:731-4.